For community groups such as clubs, please refer to the Community section’s list of community groups. The 6 km long Ara Harakeke walkway between Pukerua Bay and Plimmerton provides a scenic cycle route suitable for beginners. It is sealed throughout and has a moderate gradient. It is also suitable for one-way trips to Plimmerton, returning to Pukerua Bay by train. Experienced riders can try to tackle the 10 km long coast between Pukerua Bay and Plimmerton by mountain bike, however, the middle section requires carrying the bike over large rocks. The first section, starting from the Ocean Road car park in Pukerua Bay, provides only a narrow path between the coastal scrub. Expect to share this path with walkers. The path stops at an open gate close to Wairaka Rock and bikes have to be carried over large rocks for about 200 m around Wairaka Point until a wide deserted bay of about 3 km length opens up. There is still no formed path in this bay. It is possible to ride either on the rocky beach, or along where the vegetation starts at the high tide mark, but it is hard going. From the quarry at the next point onwards, a gravel road leads around Te Rewarewa Point, with good views towards Mana Island and the South Island, eventually meeting the sealed road from Karehana Bay to Plimmerton. Pukerua Bay School in Rawhiti Road has 2 playgrounds, one suitable for younger children (junior syndicate) and one for older children (8 years and up). A playground suitable for toddlers and young children is located in front of the Plunket Rooms/Pre-School in Wairaka Road. A small play area near Pukerua Bay train station provides a curved slide and swing set. Greenmeadows Park contains a swing set and a large lawn area. Raroa Reserve – this reserve covers around 5 ha of native bush on the hills behind Raroa Place. A walking track leads through the reserve to a lookout. Wairaka Reserve – located behind the Plunket Rooms and library in Wairaka Road, covering the steep gully leading down to Pukerua Beach. Muri Reserve – between Sea Vista Drive and Muri Station with a large grass area. The reserve is accessible from Sea Vista Drive and is also used as a dog exercise area. Greenmeadows Park – lawn area with soccer pitch at the end of Kotipu Place. Secret Valley – the gully of Waimapihi Stream between the railway line and Takutai Road is covered in native bush and has been the focus of an environmental restoration programme for the past few years. The skate park is located between Pukerua Bay Station and Sea Vista Drive. It has been completely refurbished and upgraded in 2009. Ara Harakeke – the 6 km long walkway between Pukerua Bay and Plimmerton leads through Taupo Swamp, comprised mainly of flaxes and cabbage trees. The walkway is sealed throughout and is shared with cyclists. It is also suitable for one-way walks to Plimmerton, returning to Pukerua Bay by train. 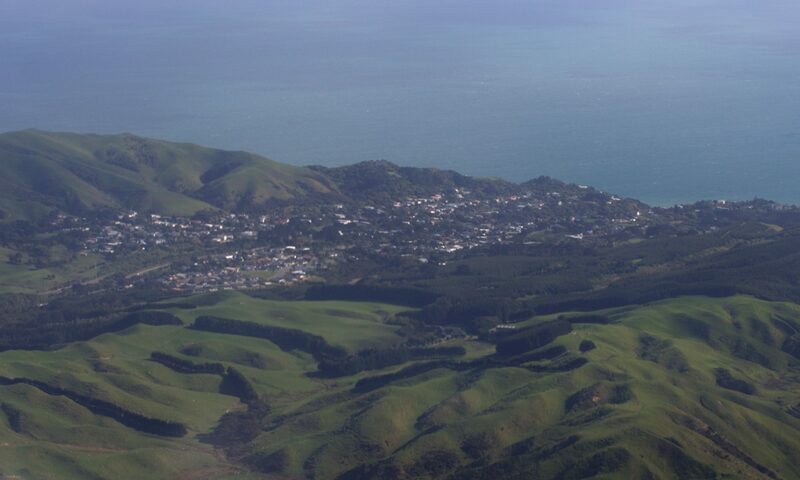 Paekakariki Escarpment track – the 10 km long track is part of the Te Araroa New Zealand walking trail. The starting points are at the northern end of the disused Muri railway station, and at Paekakariki at the SH1 bridge over the railway. The track climbs over many steps to high above the railway line, offering spectacular views over the sea towards Kapiti Island. For one-way hikes, the nearby railway stations at Pukerua Bay and Paekakariki allow the option to take the train back to close to the starting point. Note that the track is exposed and unsuitable for people with vertigo and children younger than 8 due to being narrow, with steep drop-offs to the side. Coastal Walkway – 4.5 hours each way, this walk along the coast starts from Pukerua Bay on a narrow path along the seashore, then continues with no formed track from Wairaka Point south for 2 km to a costal quarry. The walk is quite exposed to wind in places. A gravel road leads from the quarry to Karehana Bay, continuing as a residential road with footpath along the shore to Plimmerton. Raroa Walkway – accessible from the south end of Raroa Place, a track leads up through the bush to a clearing on top of the coastal cliff (10 minutes one way). The track is well-formed but steep towards the end, including tree roots which are difficult to negotiate with an all-terrain buggy. The lawn area at the top of the track provides uninterrupted views over the coast but is very exposed to any wind. Secret Valley – a 5 minute walk leads along the Waimapihi Stream in a gully of native vegetation between the railway line and Takutai Road. The walk leads past the environmental education centre and several interesting sculptures. Zigzag path from Pukerua Beach Road to Pukerua Beach – sealed, lit path with guard rails and a few benches. Zigzag path from SH1 lookout on the northern end of Pukerua Bay to Brendan Beach – sealed, steep path with great views. Goat Track from end of Rawhiti Road to Pukerua Beach – not sealed, narrow, currently not maintained and challenging in places, especially for small chidren or less fit people, due to erosion and overgrowth.